Update: Apparently Google still hasn’t been able to resolve the problem, as a helpful reader — located in San Fransisco — just sent us this screenshot, taken just minutes ago. 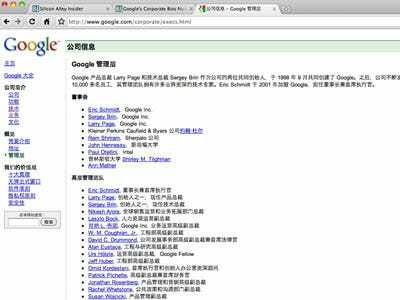 Earlier: Google‘s corporate information pages have been mysteriously displaying in Chinese for users in certain areas this morning, the Guardian reports. Google.com/corporate and google.com/corporate/executives.html — where biographical information on Eric Schmidt, Sergey Brin, Larry Page, and others is displayed — are both affected. The Guardian says the problem, though not universal, is repeatable, and Google has confirmed it. The sites display in English as normal from the Business Insider’s office. The Guardian believes this to be the result of another cyber attack on Google’s servers. Google announced recently that its servers had been hacked from somewhere in China. On Monday, the company followed through on its promise to stop censoring search results for the Chinese government, moving its search operation in the country to Hong Kong.